The legislature approved HB 12-1178 which was authored to address the rising ground water in the three communities. In November 2015, the Logan County Commissioners agreed to act as the fiscal agent for a grant application for projects to correct the problem. Tuesday the commissioners met with a geologist from the Colorado [Division of Water Resources]. Andy Horn, a geologist, is working with homeowners in the subdivisions who have been affected by high water. In some places, the water table is within inches of the ground surface. Horn approached the commissioners Tuesday about acting as the fiscal agent for a grant application. He said there will be two applications, one for Pawnee Ridge and the second for the Country Club Hills subdivision. “The issues in each subdivision are different,” Horn said. He said HB 12-1178 allocates grant funding for two fiscal years. The Sterling subdivisions will be competing with Gilcrest and LaSalle communities for a share of the $290,000 budgeted. The plan for the Pawnee Ridge subdivision includes piping water from dewatering wells and discharging it into the Gentz pond. Two wells will be manifold together and a flow meter installed. Horn expects about 400 gallons per minute to be discharged from the wells. Another area of Pawnee Ridge, near Dakota Road and Westwood Drive, have only a couple of houses with issues, he said. The proposal includes installation of a subsurface drain along Westwood Drive. He said there is one area that in December had water about six inches below ground level. “We’ve got applications and also prepared right of way requests for Dakota Road,” he said. The project in Country Club Hills could involve easements on land under the trust of the board of county commissioners, according to Horn. The project will also include excavating and installation of a sump by Cottonwood Lane under Forest Road. The pipeline would be four to six inches and move about 100 gpm, he said. Horn said the pipe is bigger than needed. The design is to decrease the resistance. “The water table doesn’t seem to be rising as much as Pawnee Ridge,” Horn said. Power for the pump will be paid the first couple of years by a grant, according to Horn. The Commissioners and County Attorney Alan Samber expressed concern with leaving the cost of the pump’s energy to individual landowners. Samber said a special tax district. Horn said he would like applications completed and submitted to the Colorado Water Conservation District board by the end of February. The board meets in March. Many Northern Colorado wells were shutdown, or access to them was reduced, by a 2006 Colorado Supreme Court ruling. Other owners had to follow augmentation plans, spending thousands of dollars to replace water they’ve taken out of the South Platte River. Prompting the study was the issue of high groundwater in some locations along the river. When some farmers weren’t allowed to pump, homeowners were starting to see flooding in their basements. Colorado State University’s Colorado Water Institute spent more than a year holding stakeholder meetings and researching the 209-page report [.pdf] — much of it before last year’s flooding. The report found a connection between the lack of pumping and required augmentation plans. It also said the system helped to protect senior surface water rights from injury. Longtime farmer Bob Sakata poked at the augmentation policy requiring well owners to cover past depletion of surface water. He thinks the situation was improved by the September floodwater. Republican State Senator and gubernatorial hopeful Greg Brophy enthusiastically took on the issue of erasing all past well debt along the South Platte. “I agree with you guys,” Brophy said, announcing plans to co-sponsor a bill with Democratic Rep. Randy Fisher to wipe out those past pumping depletions as of Sept. 12, 2013. 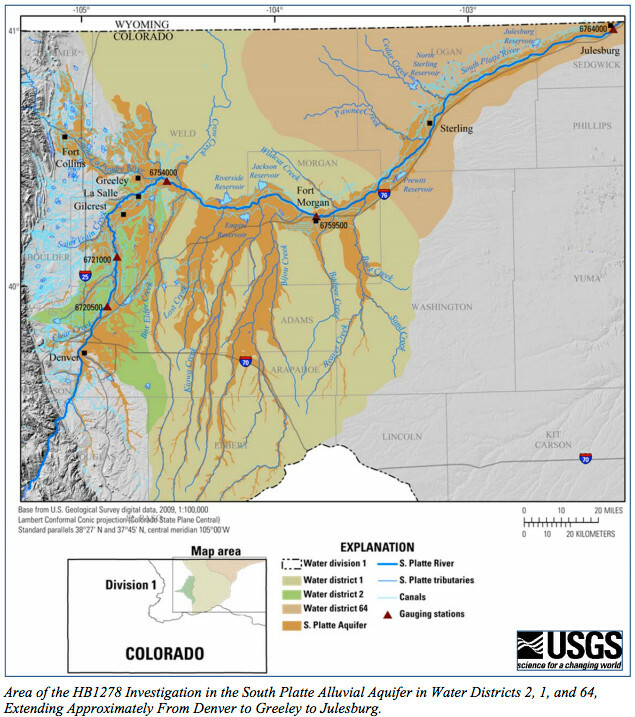 Scientists question just how much September’s floods filled up the South Platte’s aquifers. Colorado Water Institute Director Reagan Waskom says that floodwater replenishment may be true for wells right next to the South Platte. But that’s not the case miles away from the river. “The groundwater data outside of the river floodplain was not affected by the flood,” Waskom said. Meantime, Colorado legislators will need to introduce other bills to implement the recommendations of the Colorado Water Institute. In the last decade, [Nursery owner Gene Kamerzell] says state management of water rights has become more political than scientific, and farmers are suffering. Kamerzell hopes that the scientific report and the proposed legislation will help restore a different balance. Along with most things in Colorado water policy though, he knows it can take years — not days — to measure progress. Here’s a great use of social media to get the word out about HB12-1278. The YouTube video — produced and directed by Colorado Water Institute, animated by Noah Besser — follows the history of the appropriation and administration of the South Platte River downstream of the mountains. Good luck implenting HB12-1278 Reagan and team. Thanks to Coyote Gulch reader Greg from Nebraska for the link. The public is invited to Gilcrest on Thursday to attend the last of three meetings about the ongoing groundwater study in the South Platte River basin. The study, being conducted by the Colorado Water Institute at Colorado State University, is studying groundwater’s interactions with streamflows and how current augmentation requirements are impacting the alluvial aquifer. Earlier this year, Colorado House Bill 1278 was passed, authorizing the comprehensive groundwater study, which is the first since 1968, according to CSU officials. Members of the Colorado Water Institute study team have already met with the public in Longmont and Sterling this month to talk about the study, which will conclude at the of this year. They will have another public meeting from 6­8:30 p.m. Thursday at Valley High School, 1001 Birch St. in Gilcrest. Waskom is working with dozens of scientists, and aggregating data from as far back as the 1890’s to find the answer. It’s something that matters to farmers like Robert Sakata. Speaking in a facilitated dialogue, Sakata explained he used to own and use wells connected to the South Platte. In the ’70s, he and other junior water rights holders were required to replace the water they used. Fortunately for Sakata, he also owned surface water rights he could use to irrigate his crops. But other farmers weren’t as lucky. The drought of 2002 and a subsequent state Supreme Court decision in 2006 resulted in thousands of wells being curtailed and about 400 being shut down completely. “That’s almost the analogy that I see in the state right now is that to make sure we’re not injuring every person along the way, we have to have an oversupply along the whole system,” said Sakata. Meantime, Joe Frank with the Lower South Platte Water Conservancy District spoke of another reality: some of his water rights owners aren’t getting all the water they’re entitled to. The meeting raised a lot more questions than it answered for the more than 100 who attended. But Weld County Commissioner Sean Conway said it was a good beginning. 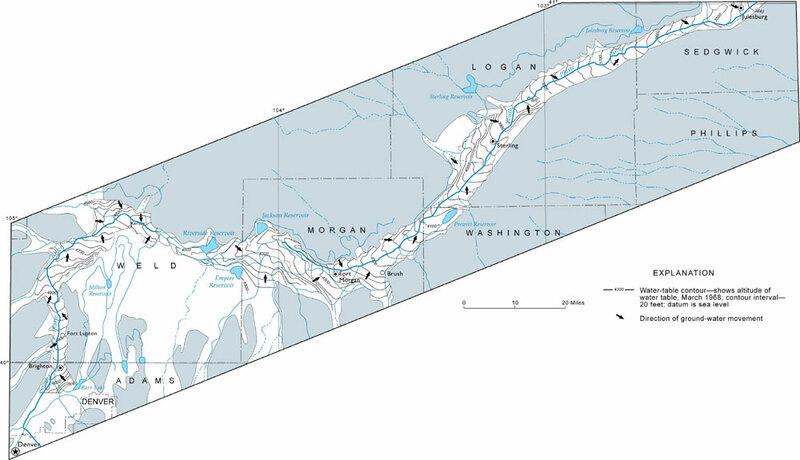 Conway is referring to the Northern Integrated Supply Project (NISP), which would build two water storage reservoirs in the region. In recent years it’s become a hotly contested project in the area. Despite the intractable nature of these water debates, the Colorado Water Institute’s Reagan Waskom said he’s determined to make the South Platte River study meaningful. More meetings are planned, click here. More 2012 Colorado legislation coverage here. More South Platte River Basin coverage here. More coverage of the shutdown of irrigation wells in the basin here. Reagan Waskom, director of the Colorado Water Institute, provided an update regarding the ongoing South Platte Basin groundwater study, which began in August. The study Waskom is heading, which will examine the relationships between groundwater and surface flows in the basin, was approved this summer when Gov. John Hickenlooper signed House Bill 1278 into law. Rep. Randy Fischer, D-Fort Collins, and Sen. Scott Renfroe, R-Eaton, sponsored the measure in an effort to better understand the cause of the high groundwater levels in the LaSalle and Gilcrest areas and other regions in the basin. The overflowing aquifers have flooded basements and fields in recent years, causing damage to homes and in lost agriculture production. Many local farmers believe the high groundwater levels are a result of wells being shut down or curtailed in 2006, when the state determined the pumping of those wells was depleting flows in the basin’s rivers. The South Platte Roundtable is serving as an advisory group for Waskom and his research team during the study. Waskom told members he’s in favor of opening up dialogue as much as possible to make sure they’re looking at all needed data, and exploring all avenues of collecting information. As Waskom explained, he’s so far coming across “a lot of data gaps” as he collects information. Gov. John Hickenlooper signed several bills today in Poncha Springs, Alamosa and South Fork…SB12S-002, Water Conservation Board Construction Fund Projects, Schwartz & White / Sonnenberg & Baumgardner, Concerning the funding of Colorado Water Conservation Board projects, and, in connection therewith, making appropriations. More 2012 Colorado legislation coverage here.